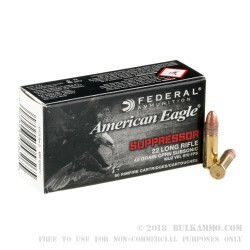 Federal American Eagle Copper Plated Round Nose 45 grain .22 LR Suppressor rounds are designed to fire at a sub-sonic velocity, making them the perfect choice to reduce noise even further with your suppressed .22 LR firearm. 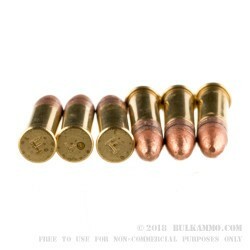 Even though these rounds are designed to work with a suppressed firearm, they will still function well in a standard, non-suppressed firearm. In fact, they will likely be quieter than standard velocity rounds due to their sub-sonic velocity. 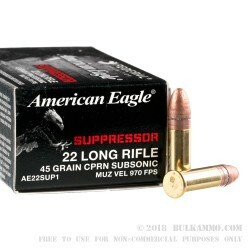 This ammo is new production, non-corrosive, clean-firing, and high quality. 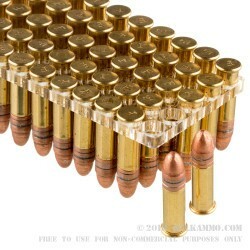 This is a brick of 500 rounds, with 10 boxes of 50 rounds.